RocketTheme WordPress Themes Review - Are They Good? RocketTheme is a US-based content management system premium theme club which provides WordPress and Joomla! themes among others. While it seems that the company has grown up around Joomla! development, there are numerous WordPress themes available for download with many more scheduled to come out later this year. There are annual and sometimes monthly fees to pay, and while they are not the cheapest option around, they do have a number of high-quality themes that may be helpful to designers creating niche blogs that require a lot of visual content. The company has a great page rank and enjoys a lot of traffic; while based in the US, they have staff from around the world, with a large concentration of developers located in Europe. Joomla! appears to be their main concentration, though they also provide products for WordPress, phpBB3, Magneto, and Drupal, as well as extensions and a user forum. Within each subsection different package are available. For our purposes we’ll be looking at their premium WordPress theme subscription service and the benefits it has to offer. RocketTheme uses the Gantry framework for their WordPress themes which enhances the dashboard user experience. 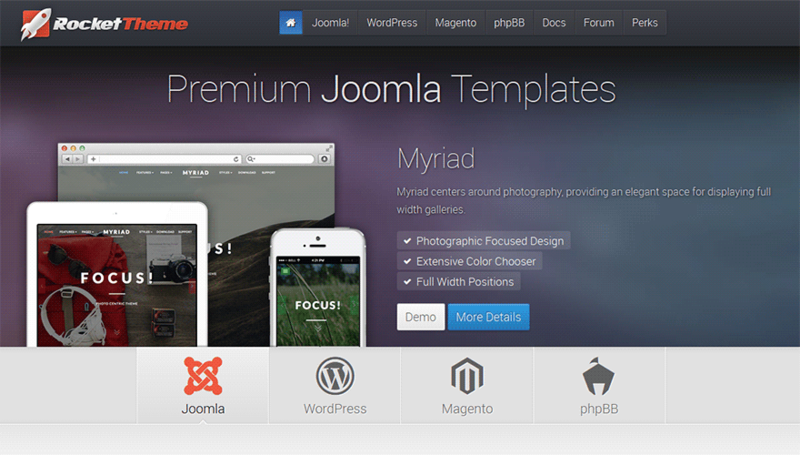 Joomla appears to be where RocketTheme got their following from. They appear to be slow in rolling out new WordPress themes. No responsive themes available. The premium WordPress theme subscription service by RocketTheme was based on their popular Joomla! Template Club, and provides unique templates designed to stand out. There are 38 paid themes in all, three free themes, and roughly one update a month on average. There are a number of different packages available based on length of time. You can subscribe for two months for $50.00, six months for $75.00, or a full year for $90.00. Renewal prices for six- and twelve-month memberships are slightly less expensive. The basic premium WordPress theme subscription service includes access to all WordPress themes as well as new themes released within the membership period. Commercial theme usage is based off “entitlements” (which are unlimited for the Developer Club), while non-profit use is unlimited. You are also granted access to the RocketTheme WordPress Community Forums and video tutorials. You can remove the branding and user-facing copyright from the material you use. The WordPress Developer Club provides access to additional features for $300.00 a year, including access to a special Developer Only section on the Community Forums, access to a “Jobs” board, eligibility for a feature in the “Spotlight” section of the site, and most relevantly, unlimited entitlements, which means you can use the themes commercially to whatever extend you want on as many sites and domains as you want. The average cost per theme is less than $3.00 for the basic package, but for the developer package it comes out significantly higher at $7.89 per theme. If you’re going to be building a lot of sites, however, you probably will need the unlimited entitlements, which would make the Developer Club the better value. You can save money renewing this package, however-you may renew the Developer Club membership annually for only $240.00 a year, which does make it more affordable over time. Theme quality is high though perhaps not as high as some of the other brands we’ve looked at. The themes are on the whole visually stimulating, which on one hand is great for some applications, but on the other may be a bit much for some purposes. There isn’t much in the way of minimalistic, impactful themes. So whether these themes are right for you may depend on the application you have in mind. The themes are also more difficult to browse through on the site than they are on some other theme club sites-they are not organized according to suggestions for use, so it’s basically up to you to look through them all and figure out what each theme might be best for. Their names don’t lend a lot of information about their nature, either, which doesn’t help when it comes to sifting through them. There are currently 38 paid themes, three free themes, and about one update a month. RocketTheme uses the Gantry framework for their themes, which enhances the dashboard user experience and assists with choosing theme options. Most of the themes come with a number of preset styles which you can choose to make large adjustments quickly and which may suit different applications. You can then use the Gantry framework to make additional modifications. You’ll find a color chooser with background picker, powered background slideshow option, viewing support for mobile devices, plugins and other options depending on the theme you choose. Some themes only have a few options while others have a number of options and features which increase their value. Some of the themes allow you to position widgets in over 60 spaces. In terms of customer service, this company is pretty good although we did not find video tutorials on the site. There are a number of tutorials which include graphics and text and which are relatively clear, but with WordPress themes, video tutorials do save a lot of time. Otherwise, we found the documentation perfectly adequate including the existing tutorials. There is a good support forum as well as an email/ticket system for specific requests. A blog on the site regularly keeps members apprised of updates, and social networking features are also available for additional fresh information.